GNR's Duff McKagan Shares Video Of Eddie Van Halen's Birthday! Home Music News GNR’s Duff McKagan Shares Video Of Eddie Van Halen’s Birthday! GNR’s Duff McKagan Shares Video Of Eddie Van Halen’s Birthday! 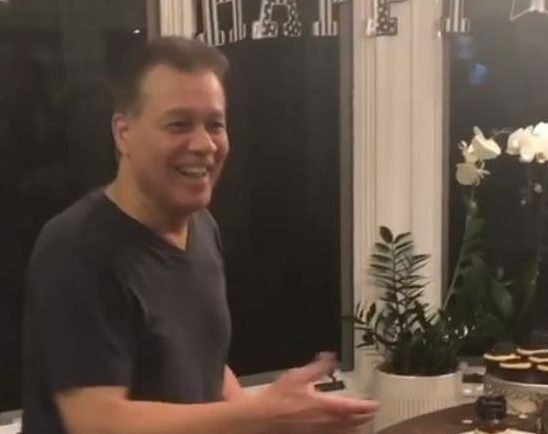 Duff McKagan bass player with Guns N’ Roses as well as his wife Susan have posted the first 2019 footage of veteran rocker, Eddie Van Halen, from his birthday party. According to Alternative Nation, The Van Halen frontman seemed to be in very good form, offering his thanks to everyone in attendance. Susan Holmes McKagan said in a post on Instagram, “Happy Birthday #EVH !! !We LoVE You! Killer nt w @officialduffmckagan celebratin’ your bday ‼️#comedians 藍#salsadancinglessons and #cake oh my  @janievanhalne u throw one hell of a partay Xxooxoxo 落@eddievanhalen. Check out the clip below! Jack Osbourne Says Ozzy Is Well And Back To ‘His Cynical Old Self’!